I could swear it was just yesterday that I burst into tears in the parking lot of my child's school the first day of kindergarten. But we just spent the past week getting ready for the first day of high school. Many of my students are just sending their little ones off to school for the first time. For others, they're starting a new career because the kids are off to college. What they all share in common is a desire to use their talents to do work they love and get pa1d for it at the same time. "Pack Rats" are everywhere, in all economic groups. No matter how beautiful a house looks when you drive up, you're likely to find it stuffed with items that have seen better days. This can be a real revenue booster for you, or a big financial drain, it all depends on whether you have set the right pricing strategy. In course 2 of the Staging Diva Training Program, The Business of Home Staging: What you need to start and how to grow, you'll learn how you can make m0ney with Pack Rat clients with the right pricing strategy. 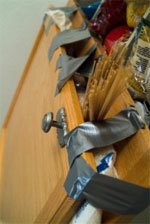 You might be surprised to learn that I actually hate dealing with clutter! When I see hallways piled with stuff, my first impulse is to turn and run. Over 6 years as a stager and hundreds of homes, I've found a way to make this work for me and let me focus on the part I like which is the decorating, not the sorting of stuff. In Course 5 "Over 30 More Ways to Make M0ney in Home Staging," you learn that I bring in people who live for clutter busting projects. And I still make m0ney on their services without having to do the work I don't like myself. I'm really committed to putting an end to the ridiculous practice of doing f/ree home staging estimates, which invariably end up being f/ree consultations because once you're in a client's house they'll ask your opinion on everything from where to put the sofa, to what color to paint. 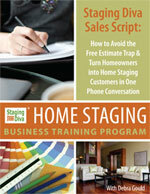 Visiting prospective home staging clients at their homes for f/ree is a fast road to burnout and bankruptcy. That's why I decided to share the script I use to book clients. You can copy me word for word in your own conversations and stop running around doing f/ree estimates and start earning what you're worth. What if I forget what to do when I get to a client's house? I'm surprised how often I hear from new home stagers who have their first client appointment booked with no understanding of what they're going to do when they get there. Invariably I hear from them the morning of, or the day before, their first client home staging consultation. Perhaps it is sheer nervousness that triggers that "I have no idea what I'm doing" feeling but it reminds me of those 'back to school nightmares' I still sometimes have where I'm on my way to an exam, have no idea where the classroom is and suddenly realize I've never attended the course! This prompted me to write the "Staging Diva Home Staging Consultation Checklist With Room-by-Room Client Planning Forms." This is really two products in one. The first part guides you through how to do a home staging consultation and the second part, the Room-by-Room Client Planning Forms, are exactly that. All you have to do is put your own logo and contact information on the cover of the planning forms section and then photocopy the rest. You'll have forms and checklists to fill out for every room in the house! 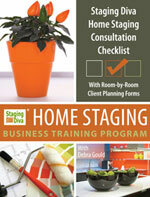 You can fill it out yourself or let your client do it as you go room by room during your home staging consultation. At the end of your meeting, you'll have a professional looking and complete document to leave with your client. I'm pleased to announce Sandy's promotion to Client Relations Manager. We have been working together for 2 years, meaning that we've grown Staging Diva together. When she joined me there were about 300 Graduates and now there are 900+ Graduates and over 13,000 subscribers to Staging Diva Dispatch. That's a lot of people who may want to contact us! Sandy continues to do an outstanding job of taking care of students, Graduates and anyone else who needs help. She answers questions, keeps the Staging Diva Network humming, ensures students receive their course materials, that Graduate Certificates go out in a timely fashion, and many other behind the scenes details. I couldn't run this business without her. Email Sandy when you need help! Summer has gone too quickly but I confess September is one of my favorite months. It always feels like a new year to me, with all the excitement of new beginnings that this can bring. September feels like the time to get organized and get busy with new projects. I started my first business in September of 1989. The economy was just sliding into a recession and I quit a high paying job to become a marketing consultant. Everyone thought I was nuts leaving job security behind, especially since I had just bought my first property on my own and the mortgage was all mine. It's hard to believe that was 19 years ago! But I achieved my dream of being a full time entrepreneur by the time I was 30. I knew that in a recession there is actually more security in being your own b0ss, especially if you're in a business without much overhead! Six years ago this month, I moved cities and started my staging company, Six Elements Inc., another big gamble considering I'd just bought my sixth house on my own, I had a child to support, and I had just moved to one of the most expensive cities in North America. But I knew it wasn't really a gamble because home staging requires little investment, most homes on the market show terribly, and you can make lots of m0ney while you're doing it! So as I head into my seventh year as a home stager, I'm thrilled to say I never get bored with this work. It continues to offer creative challenges and the satisfaction of the real difference I can make in my clients' lives. I've spent the summer hard at work on a number of products and projects to help my fellow home stagers. 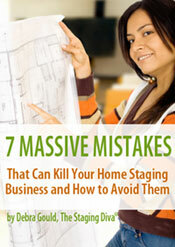 The first of these is a special new report, 7 Massive Mistakes That Can Kill Your Home Staging Business and How to Avoid Them. For Staging Diva Graduates who already have their own full-blown websites, we've created a new advertising opportunity for you with Mini Staging Diva Directory Listings, a lower cost alternative to the usual Profile Pages. I've been doing some web research and discovered while the number of websites that Google finds for the phrase "Directory of Home Stagers" has grown 258% to almost 2.2 million sites in less than 4 months, the Staging Diva Directory is still number one! That's a lot of competition and why I spend so much time and m0ney working on supporting the Staging Diva Directory of Home Stagers, so Graduates who participate can continue to get found by homeowners and agents looking for stagers. You can see the two Google snapshots of results here. I'm delighted to announce the promotion of Sandy Zuniga to the position of Client Relations Manager! She has worked with me for two years and has really grown into her role over that time. Starting as my assistant, Sandy quickly proved her ability to deal with the hundreds of inquiries we receive daily, and has done a great job of meeting the needs of students and graduates alike. You can read more in the sidebar story in this issue. P.S. I'd like to invite you listen to a f/ree 90 minute edition of Ask Staging Diva Live! You can download it here. Does your business card need a makeover? Pack Rats: Not just on Oprah! Focal Point: Every room should have one! This family room is a jumbled mess of "puzzle pieces" all in the wrong place. 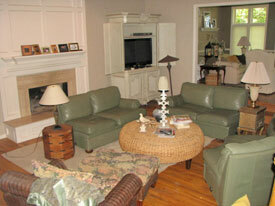 The home stager's job is to sort through the pieces and create a welcoming environment for homebuyers. Here Staging Diva Graduate Dolly DeWald of D3 Dolly DeWald Designs found the all-important focal point of the room and rearranged the puzzle pieces into a cohesive and attractive arrangement. One of the principals of interior design or decorating is to create a focal point in a room. This is especially important in staging because you don't want a prospective buyer's eyes darting all over the room in a distracted way. There has to be a focus, or focal point, so that the eye has somewhere to rest while the brain takes in the overall environment. You do not need to be a trained interior designer or decorator to create this, its pretty much common sense if you have some natural decorating talent. Clearly Staging Diva Graduate Dolly Dewald has that talent because this set of her before and after portfolio shots of a family room displays such a great example of finding the focal point (in this case the fireplace) and arranging the rest of the room around that. 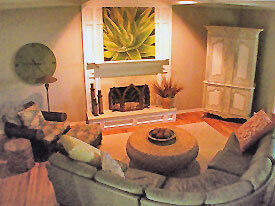 Focal points can be architectural features like a fireplace, or they can be created with furniture and accessories. For example, a beautifully dressed bed, a table with a flower arrangement, a striking piece of art, or even a great view. The goal is to make the focal point something attractive and arrange everything around that to create a sense of harmony. In Course 3 of the Staging Diva Training Program, Taking the Mystery Out of Home Staging Consultations, I discuss more of the common decorating mistakes you'll find in homes and what to do about them during staging. I also tackle how to make your recommendations to clients so they aren't offended by your suggestions and they're more likely to allow you to implement them. 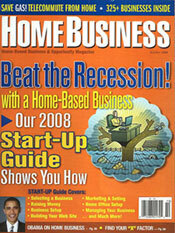 I am featured as the October 2008 "Success Story" on page 88 of Home Business Magazine. Excerpt: "Debra Gould bought, decorated and sold six of her own homes in eight years while she ran her marketing consulting business from home. This led her into a new career as a home stager. It was the perfect way to combine her passions for decorating and real estate without being on call 24/7 the way agents are. Gould finally found a way to fully use her creativity without becoming a starving artist. In fact, she was able to earn $10,000 a month staging homes by her second year in business. With the important fall real estate market getting underway, now is the time to make sure the business image you are projecting is as professional as you want it to be. We tell prospective home staging clients that they never get a second chance to make a first impression and that's why they should invest in home staging. But what first impression are you creating with them when you hand out your business card? Are you inspiring prospective clients to trust you with their single largest investment, their home, because of your obvious aesthetic sense? I want to congratulate Staging Diva Graduate Hayley Harris of Australia who, although she had already invested in having a graphic designer do her original business cards, recognized that they weren't at the level they should be to attract the kind of home staging clients she was after. "I really want others to learn from my mistakes. I won't go on but basically you pay peanuts you get monkeys. This is my third shot at logo and business card and I basically put up with the previous ones thinking 'they'll do.' Well in this business I have learned that 'they'll do' is not acceptable. I tested the water for a while and when I decided I was going for it big time I knew that I was going to have to put my money where my mouth is. It has cost me, but it has been worth every penny. I have received some amazing comments about the new design and am very excited about it. 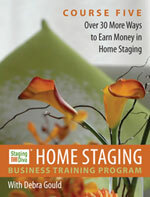 I know this sounds corny but I now feel like a proper home stager rather than someone just playing at it." I'm confident that Hayley's business card redesign (with new website to follow) will be a total turning point for her business. Mindset is so key. If you feel less than proud of what you're putting out there, it will show in how you talk about your business, and your whole body language (which is always being read by others). You can read more about this in a related story, Home Stagers: Are you Ready for the Fall Real Estate Market? 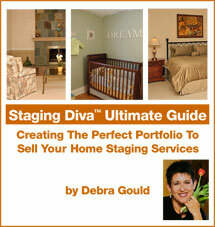 Business cards, logos, photos, testimonials and how you write about what you do, are discussed in detail in the Staging Diva Ultimate Guide: Creating The Perfect Portfolio to Sell Your Home Staging Services. You'll find practical exercises and even a 'creative brief' that you can give to a graphic designer to get a great logo. Congratulations to Staging Diva Graduate Laura Jensen of Lakeshore Staging and Redesign (WI) who staged a Lake Geneva Parade of Homes house for a local builder. This is an excellent way to increase your profile as a stager in the community and develop relationships with builders who can be lucrative ongoing clients. Laura has been a member of the Staging Diva Directory of Home Stagers for almost two years. Congratulations to Staging Diva Graduate Michelle Lane of Center Stage LLC (NJ) who staged a kitchen and dining room for a Fund Raiser last spring. This lead directly to being contacted for a shoot and interview for a full page feature in a New Jersey lifestyle magazine this fall. Michelle writes, "Debra always mentions that a job can come from an effort spent months earlier - now I'm a believer!" Congratulations and a special welcome to Tina Humburg our first Staging Diva Graduate in Germany. She is a very talented woman, read her story here. Kathy Snyder of Your Home Staging Team, Inc.
With the recent move to the new and improved format for the Staging Diva Directory of Home Stagers I've been able to find a way to create a Mini Listing for Graduates who already have their own sites. A Mini Listing is far less comprehensive in that it doesn't include 600 words of text about you, or your portfolio photos the way a Profile Page Listing does, a Mini Listing does give you a way to enjoy many of the benefits of being part of such a high profile site, but at a lower cost. Note that you can only participate in a Mini Listing if you're a Staging Diva Graduate and you already have a full website with photos of your own work (not stock shots) and it is a stand alone site (not part of another company's website or directory).